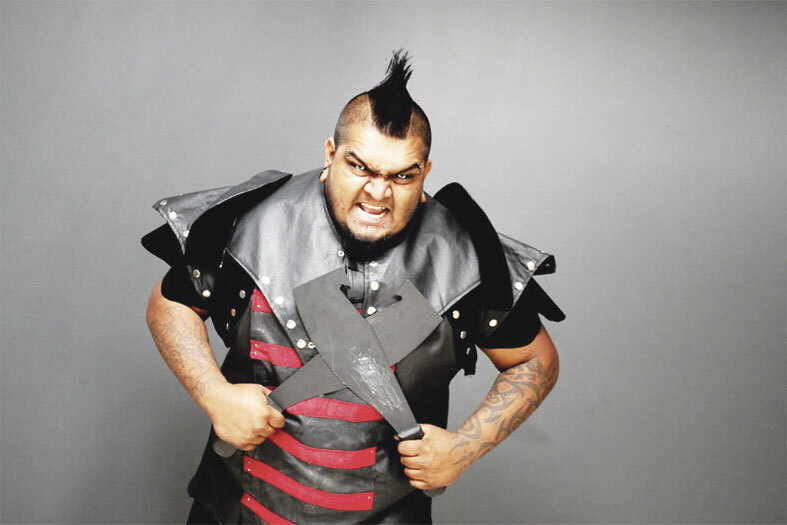 Chatsworth resident Daryl Naidu affectionately known to many as ‘Nightmare’ is one of the most respected professional wrestlers within South Africa. In addition to being known for his wrestling talents, Nighmare is also a dedicated community activist who is committed to making a difference to the lives of others. Nightmare shared his Journey with the Chatsworth Tabloid. Briefly tell us about your upbringing? I was a kid who had a very good upbringing from my parents and I was not born with a silver spoon in my mouth. I grew up in Chatsworth. I experienced struggles and did not come from a rich family. We had a hard life growing up. My parents taught us business sense. I have been through the good, bad and ugly of Chatsworth. I grew up as an innocent kid and eventually started becoming the people I started joining. Even though I have travelled the world and had a lot of international exposure, Chatsworth is where my heart is. CT: Professional wrestling, how did that come about? DN: As a young kid growing up, I used to watch a lot of Marvel inspired cartoons. I had my first dose of WWE which was then known as WWF when I was quite young. I started following them and got hooked onto wrestling as they were real life superheroes for us. They inspired me and I was glued onto wrestling. Music also helped me to make the transition from being a normal person to a wrestler. When I started seeing that there were wrestling trials being done in South Africa, I took a chance and went for the trials. At the time, I did not know much about wrestling and was just a fan. After being chosen due to my personality and look, everything went uphill. My career is about 13-years-old now. Trying to break into the wrestling industry as an Indian youngster was difficult. I did encounter racism. I was given tools but I had to push to make my career happen. CT: What are some of the highlights of your career? As my career started off, I got television opportunities where I appeared on national TV for wrestling. A good friend of mine who was headed to WWE when I started my career was South Africa’s Justin Gabriel. We have always been in contact and he has told me about the bad side of the USA. As a volunteer at the Chatsworth Youth Centre, I used to encounter kids who would come up to me and ask me to take them to the WWE show. It was simply not affordable so I had a dream to bring the WWE to us in Chatsworth. When they were on tour in South Africa, I phoned my friend Justin Gabriel and he gave me some of the WWE corporate numbers and suggested that I phone them and said that he would also help out. One of my career highlights was bringing himself, Natalya and other WWE superstars to the Chatsworth Youth Centre. They gave a talk to about 400 kids. In 2013, the WWE once again came to the youth centre and among those present included Sheamus and Alberto Del Rio. I am passionate about promoting anti-bullying and even have a tattoo which says: ‘Don’t be a bully, be a star’. Another highlight was going to India and working with guys such as Bobby Lashley and Carlito. I also was involved in the Arnold Classic. It is a big sporting event throughout the world where Arnold Schwarzenegger orchestrates all sporting codes under one house.We were fortunate to have a sporting event there about two years ago and some big-stars such as Shelton Benjamin came down for the wrestling. I had the opportunity to wrestle Manu and Lloyd Anoa’i who are Dwayne Johnson’s first-cousins. I have helped to train a lot of local youth. One of them named Canron Papiah who is known as Shadow has been to the USA. CT: How did you get involved in community activism? DN: It started with me joining the legendary wrestler Tiger Ellappen. We arranged to have a wrestling ring in the Chatsworth Youth Centre and I started a wrestling school for the youth. Being in the youth centre, I watched the charity work that they were doing and volunteered my time. It started with the youth centre. When we had free time, we were doing something for the community. Once you see people smiling and know that you have helped to get them there, it is a true blessing. We know that we are in a position to do things, so we always try and do things for the kids. It is sad that we have a lot of people who can make a difference but turn a blind eye to society. I want to make this a better place for my nephews, friends and followers to live in a better place so charity work started from the Chatsworth Youth Centre and ever since, we have been growing. anti bullying initiative, tell us about that? DN: I was running under the WWE slogan of ‘don’t be a bully, be a star’. I still go around using that message. I have seen what has been going wrong in Chatsworth. I feel very strong about promoting a message of anti-bullying. I was a kid who was also bullied in school. Growing up as a kid, it did affect me. When I first went to high school, I did not know what bullying was until I had my money and lunch stolen from me. It forced me to become a hard person where I had to fight back. Wrestling has helped me to get through a lot of hard-times and I enjoyed becoming a wrestler as it was a dream. When kids go to school, they don’t want to see people coming in with suit and ties and preaching to them. I use my life-experiences and go to the core of identifying with the kids. When I talk, they understand what I am talking about and can relate. I use humour and make the kids feel special. I am passionate about sharing my life-story. If I can change one person, they can potentially become a leader and from there, they can start a chain-reaction. I have been going to a lot of schools and sharing a very important message with them. My anti-bullying campaign is basically giving back to my young brothers and sisters to empower them and not let them go through the same route that I went. Everyone has to go through a bad patch but if we as community leaders can assist, we can stop them from going that route. My anti-bullying campaign will not stop anytime soon. CT: What advice would you give to the youth to lead positive lives? DN: When I was growing up, I had a lot of fun climbing trees and was always running. In today’s world, things are too digital. I feel that today, people have isolated themselves and kids are becoming anti-social. A problem is that there is a lack of activities for youngsters to get involved in. We do not have active platforms which kids can latch onto. For instance, if kids want to play pool, they have to usually go into an unhealthy environment such as a bar instead of an healthy one. They also need to spend quality family time. Things are very difficult for many parents as they have to work and unfortunately, they don’t get to spend quality family time. That can lead to kids joining the wrong company and they can become the people whom they start to join. If parents can make their kids comfortable around them, they will share information about what is happening in their lives instead of isolating themselves. My escape was sports. I chose sports because it made me feel better about myself. As parents, you should encourage your kids to participate in sports.